Click here for full size figure. 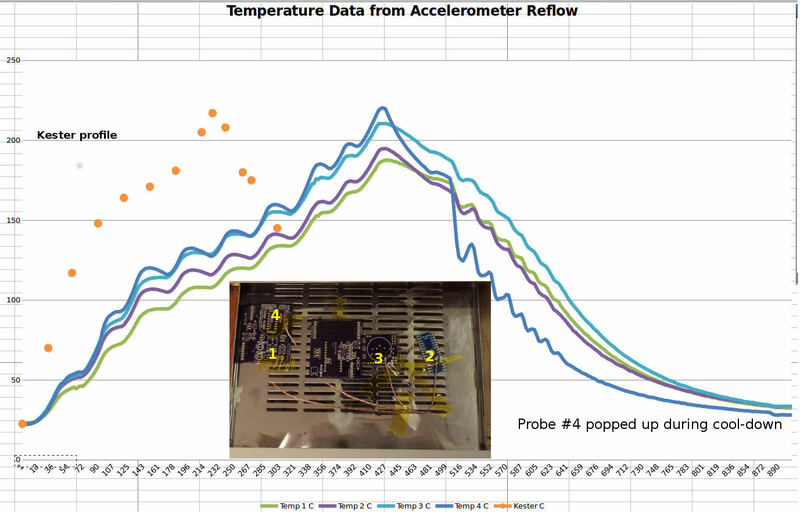 Here are the temps in degrees C vs elapsed seconds from four type K thermocouples on PCB surfaces in my T-962 (small) reflow oven running “wave 2” (regular lead solder paste) profile. The orange dots show the recommended Kester reflow solder profile for the solder paste used. Probes #1 & #4 are on the surface of a PCB on top of one other, while #2 & #3 are on PCBs sitting on the oven drawer surface. Probe #4 is directly under one of the quartz heating tubes while the others are positioned in between the two tubes. Probe #4 popped up off the board during cool-down, so it immediately got cooler as the fan blew on it (emulating the crazy-wrong temperatures showed on the T-962 front panel). The executive summary is that the oven barely works in the middle of the drawer for a very liberal definition of “barely” (i.e. the duration of various temperatures and heating/cooling rates violate manufacturer’s specs by more than a little bit. But this same run soldered an accelerometer breakout board well (looked good under a microscope and ran OK after a quick ECO unrelated to the soldering was applied). The breakout board is sitting just to the left of probe #3. Chip McClelland set up the thermocouples and wrote the Arduino logger app running in his Sparkfun “Red board” while Gene Kahn and I provided moral support. Screw some aluminum angle stock onto the bottom of the oven and apply various other “patches” to reduce air flow in/out of the oven when the cooling fan is not running. Add an “air stirring blade” of some kind to circulate the oven air (NOT blowing outside air into the oven as recommended elsewhere on the Internet). Switch to custom heating profiles to trick the oven into coming closer to a recommended profile. Switch to a custom controller that’s driven by board temperatures, not the temperature of the air above the boards. This will most likely use a Raspberry Pi running x11vnc and just hanging on the house LAN, so any other computer or laptop can run a UI for it.